We're up for the challenge! Glenis and I haven’t run across any moose during any of our adventures. I think we are laughing too much and we scare they away. Once I though I was following the foot prints of another racer until I cam upon a pile of moose dung and I realized I wasn’t following a person! Another reason to laugh! 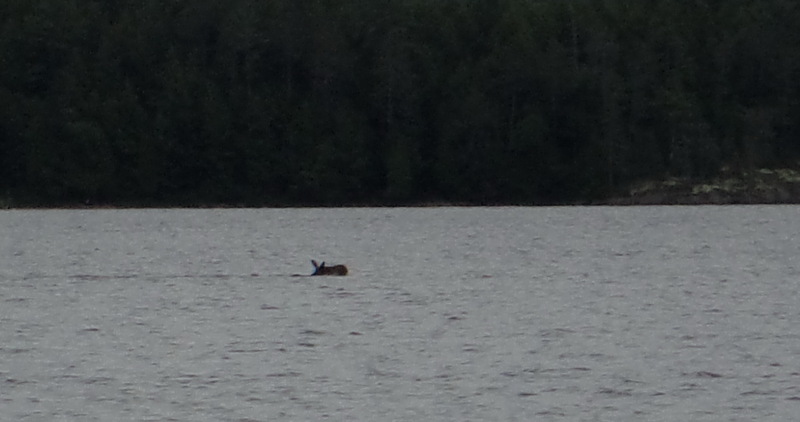 One of the cool things I saw on my recent camping trip to Algonquin was a moose swimming across Rock Lake. It was a pretty impressive thing to see. The moose swimming Rock Lake. My little camera was pushed to the limit trying to get a close up. But you can tell it’s not a beaver. Very cool. I don’t think I will see this again. I had decided to take a little run down a trail that started at the camp and ran along an old railroad bed between a beaver pond and Rock Lake. I was hoping to see a beaver but I did notice that I wasn’t the only one on the trail; either a large deer or a small moose had walked there before me. When I decided to turn about I heard a scuffle in the brush on the lake side of the trail but I didn’t think too much about it because chipmunks can sound huge when you are alone in the forest. As I turned onto the little beach and look back towards where I had ran I noticed what at first I though was a beaver swimming the lake. However then the ears flopped and they were huge compared to a beavers I realized I was watching a moose. I figured I must have spooked him into the water and away he/she went. I stood there for 15 minutes watching the effort and strength of this moose swim across Rock Lake. This is the view of Rock Lake from atop of the Booth’s Rock Trail. Algonquin has a wonderful history. #100happydays Day 60 Did I see a Bear? My husband and I went on a great camping vacation last week, while Glenis manned the fort and the blog. We have an eventful trip, and a great time. On Thursday we moved from Algonquin Park to Arrowhead Park. 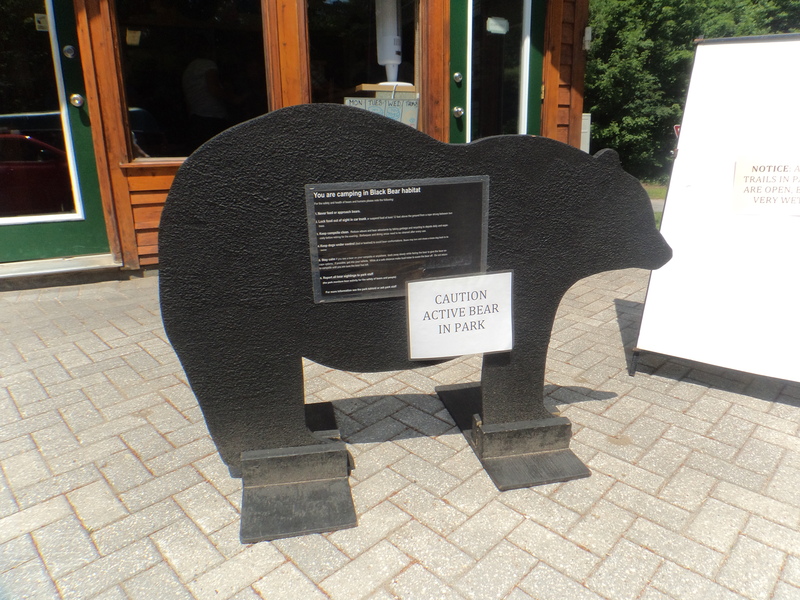 On the way into the park, Phil noticed a large cut out bear sign warning people in the park that there was a bear that was in the park snooping around the campsites. I didn’t even notice the sign. When Phil mentioned it I sort of fluffed the warning off. I just thought it was used to try to convince people to keep their camp sites clean and to use the garbage containers supplied. How could i have missed this bear sign! Nope, not so, I wasn’t there 45 minutes and I found the bear! I was so surprised I didn’t even get my camera out! I was driving to the park store to buy wood and ice and got all turned around on the twisty park roads. The little guy, (I think he was little, just about hip high) ran out in front of my car, from one campsite to another then up into the trees. It was kind of cool seeing a bear from the safety of my car. In all the times Glenis and I have run in the woods or have been on an adventure race we have never come across a bear. I was even thinking about bear safety this past week and picked up a bear air horn at an outfitters store. I guess the trick will be to see if I can use it when surprised by a bear when I am outside my car. #100happydays Day 34 Watch out for it! Love the trails but not the Poison Ivy! It’s good we know what it looks like. I heard the Jewel Weed is an natural antidote to the rash the the ivy can give you, but we don’t want to find out if it’s true! The picture here is from this mornings run. We are seeing a lot of poison ivy along the trails this year. Maybe it’s because we finally know what it looks like! 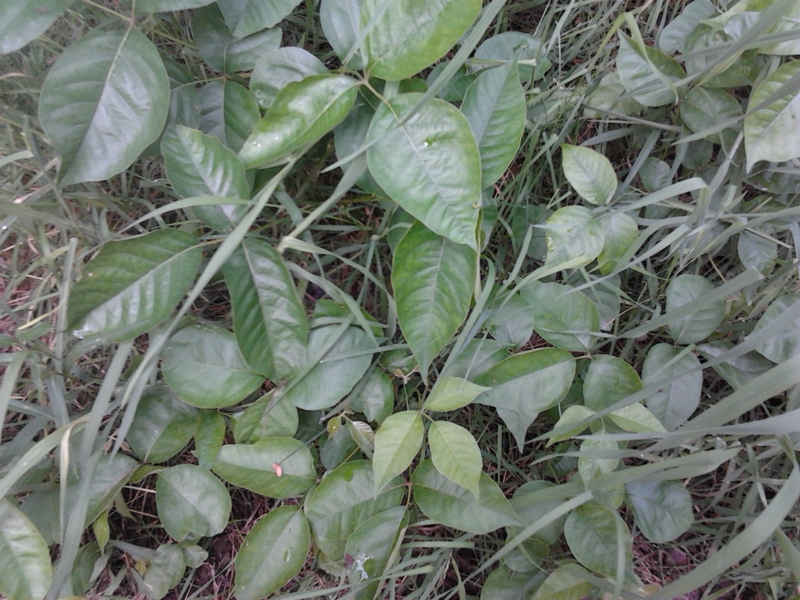 Poison ivy belongs to the same plant family as the trees producing the mango and the cashew nut. Urushiol oil is so potent that only one nanogram (billionth of a gram) is needed to cause a rash. No animal can get a rash from poison ivy, but they can get the urushiol oil on their fur. Goats and other grazers eat poison ivy, and birds eat the seeds. Scanlon over the years has become one of our favorite places to run, hike, and unwind. We really enjoy the many trails of different terrain it gives us lots of options to choose from so it’s never the same experience twice. We have made many incredible memories there which Phil has captured on film, put to music it really shows what nut cases we really are. To “us” though it really shows how much fun we can conjure up for ourselves. 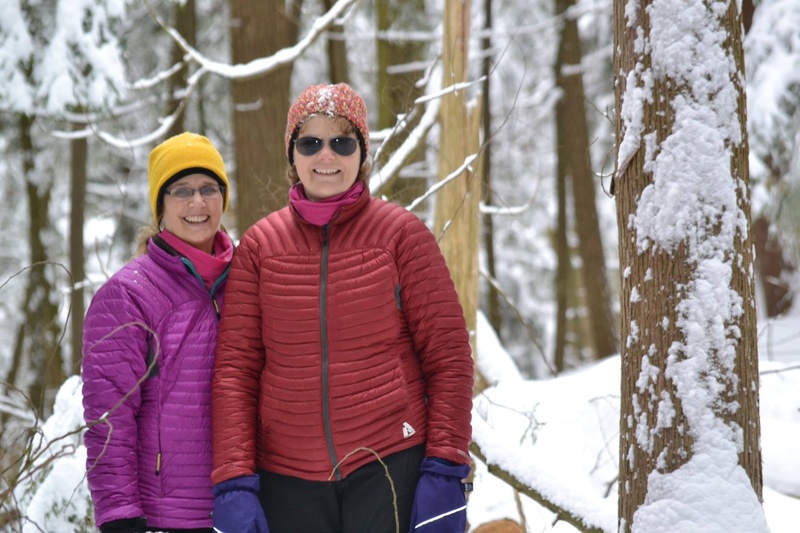 Whether it’s snowshoeing amongst the snow covered trees, feeding the birds where they actually land in your hands, or making snow angels, winter in Scanlon is breathtaking. Check out my new shoes! Age and Beauty love when the Trilliums come out at this time of year! Driving on a Parkway and Parking in a Driveway my whole life.